Golden Cherry Casino for US Players- All Blackjack Varieties! Golden Cherry Casino for US Players- All Blackjack Varieties! Blackjack has been an organized card game since the 1700s, though it hasn't always been call by that name. At Golden Cherry , there are still a wide range of blackjack varieties for the game "21," such as "Pontoon," "Vingt-et-Un," and "Hokkien." 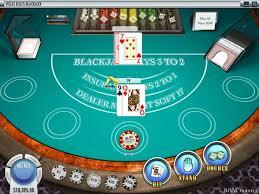 There are also online casinos that offer Live versions of the game, which has live dealers via webcams. The rules all revolve around the number 21. This is the score required for the player to win. They reach this goal by receiving cards from the dealer in specific and varied ways. The Ace is the most versatile card. It is worth eleven, unless it will "bust" a player, at which time its value is converted to one. All of the face cards (Jack, Queen, and King) are worth ten. The numbered ones are worth their face value. Titles such as "Triple 7s" add to the blackjack varieties by making special rewards for specific wilds, such as the seven. We offer the best casino for US players by inviting them to try our ultra-realistic blackjack games today. For these types of play, any participant who receives three sevens, either in matching suits, or in any combination, will win a higher payout than standard (which is usually a 3:1 on the initial wager). Some blackjack varieties rely on older methods, such as "Pontoon." This game has additional rules and offers a unique "take" on the commonly played casino version. The popular "Spanish 21" removes all of the "tens" from the decks and makes it much more challenging to win against the house. Other types of competitions allow people to increase their chances at financial wins by purchasing "insurance" against the dealer's hand, or by placing side bets on the match. In "High Streak," for example, participants are rewarded when they win consecutive hands, with larger and larger returns against their initial bet. We also offer US players the "Super Fun" and "Double" varieties, which expand the rules by allowing "doubling down" on an initial bet in order to increase overall winnings. With the popularity of the game comes an environment that is favorable to tournament competition. These events allow participants to use up to five hands at a time, or they pit professionals against each other, with large sums of money, in formalized elimination contests.